The easy way is to update the theme via Envato Market plugin – this can be done directly from your Dashboard. 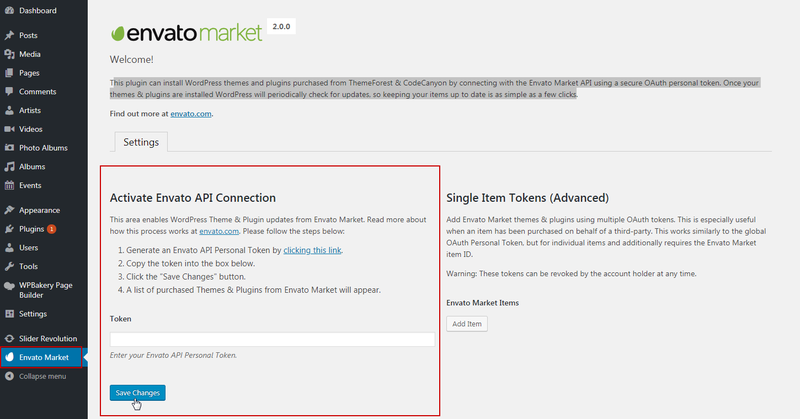 Please navigate to Envato Market page and activate your Envato Connection – create a token, copy it here and click Save. After you have succesfully entered a token, you should see something like this. Click on Update Available and the theme will be updated. Once the update is finished, the Update Available message will no longer be present, and the theme version will be changed. But we will also have to update the plugins, that the theme comes with. For this, please go to “Plugins” and check if there is any message to update the theme plugins. Follow the instructions and update the plugins. Download again the theme (installer package) from ThemeForest. Unzip the theme installer .zip file and you’ll obtain slide theme folder. Connect to your website via FTP and navigate to [wordpress install directory]/wp-content/themes/. Copy your new slide folder over existing folder with the same name, on this location.